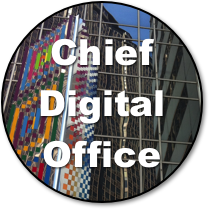 The Chief Digital Office serves senior leadership and digital executives by curating the most visionary and practical thought leadership on digital transformation, from a social business perspective. It presents the outlook for CDO challenges and opportunities, CSRA CDO research and posts, CDO reference research from third parties, and select CDO online discussions. I invite you to use this page as your concierge for strategic and practical guidance on digital transformation of complex organizations. The friction of getting ideas and turning them into things people want to buy has plummeted. Management consultants like yours truly have always been fond of talking about “transformation,” but digital+social+mobile is unprecedented because it makes sociality, the core of humanness, digital and everywhere. Practically speaking, though, where does this leave large organizations? As described in more detail in The Social Channel, the economics of the Industrial Economy organization are in doubt—because efficient organization spontaneously coalesces everywhere now, so the organization’s efficiency competitive advantage is evaporating. Another challenge is that there is significant confusion among analysts and boardrooms about the CDO: they have the tendency to lump transformation and digital operations together, which is a major mistake. Think long and hard about the fact that digital interactions are one tenth the cost or lower than analog (offline). Enterprises that delay transforming operations to use free digital interactions allow pressure—and risk—to build up. Transformation always requires mindset change before successful initiatives can be planned and executed. Here is a sampling of profound change I regularly see. Leverage the digital social network effect to create new sources of influence and profit. You activate it by relating to few, high priority people personally in digital social venues, where your interactions become annuities of care and relevance. It works when teams learn how to relate to people authentically, without selling. Tap two-way digital interactions to discover the power of user outcomes, the key to magnifying your relevance and profit. People buy products and services that produce outcomes that are personally meaningful. Because communicating with people is so cheap now, firms need to reorient themselves to focus on the personal meaning of using their products/services. Firms that make the mental shift will dramatically increase relevance and profit, but it requires a complete orientation change. Grow beyond us and them thinking. 20th century management revolved around “producer” and “consumer” roles in the economy. Firms still regard “customers” as mouths or wallets, not valued collaborators. By adopting collaborative attitudes, firms will unleash continuous, inexpensive innovation at all levels. They need an approach to break the rules, gradually. Get over old fashioned employer-employee approaches in which firms researched, templated and dictated the structure of work. This worked when people operated machines, but now value is produced when people collaborate creatively with other people. Organizations need to learn how to enable workers decide how to accomplish their goals. This is the key to 21st century productivity. Master 21st century “market entry.” Increasingly everyone around the world is “online,” especially in lush emerging markets. Firms that learn how to relate to people can tap global knowledge and information instantly. They can use digital social to diligence, prequalify and build demand anywhere, very rapidly and inexpensively. They need to learn how to relate and collaborate across borders. Digital social interactions now happen 10 times faster at one tenth the cost, so opportunities are virtually unlimited. Here are some general examples. Digivents—By 2013, most advanced firms are using “social media” to promote their IRL physical events, but Digivents pushes “virtual/physical” to a completely different level. Physical events become the platform for digital sharing and engagement, focused on client/customer outcomes. By using video and social platforms to knit together onsite and online prospects, you dramatically increase ROI because your planned and spontaneous interactions show your relevance to a much larger audience—forever. New Business Alumni—Knowledge Economy leaders believe in and nurture relationships with their people before, during and after “employment” with the firm. By actively mentoring employees in creating rich collaborative connections in firm and non-firm digital social networks, firms empower employees to maintain relationships with prospective employees and alumni, who are usually affiliated with firms who need their expertise, products and services. Community Company—here, the firm serves as an enabler for its online community, whose members design products/services and decide which are made into physical goods (if applicable). By giving customers a role in designing products or services, you increase engagement for participants and their families, friends and digital social networks. Profits are sharp because the community’s friends are ready buyers, and you have the opportunity to make to order, or at least gauge demand better. Social Business Models and Social Business Opportunity drill down into industries and enterprise functions. CSRA helps CDOs, CEOs and boards to use social business and assess its immediate relevance to the business. We address the entire Social Business Strategy Life Cycle. To learn more, see How We Work or contact me. Even more posts on digital transformation pertinent to CDOs. Social Business Competency Center–Offers a curated selection of CSRA’s extensive thought leadership and reports on creating new levels of experience, service and profit. It shows how enterprises make more money by adopting a more personal, human approach to people. Digital social makes this efficient and lucrative for the first time. Mobile Competency Center–Reveals mobile’s two-way opportunity to elevate firm and brand relationships with customers and other stakeholders (“users”): understanding user behavior through mobile data and empowering users with mobile apps that boost their value of using products and services. Big Data & Analytics Competency Center–Leverages social intelligence to take a lean approach to big data. Big Data & Analytics is high risk because it often assumes big ticket I.T.-style investing. This shows how to validate user acceptance using social business before significant I.T. investments take place. Ecommerce Competency Center–Focuses on using websites to relate to users at a new level, thereby creating new revenue opportunities. It advocates ecosystem-centric website design that’s grounded in interoperating with social venues and mobile while leveraging the new level of insights big data can offer. In-depth CSRA and third-party analyses and reports on Chief Digital Officers and enterprise transformation. More reference/digital transformation/foundation resources: short list or long list.